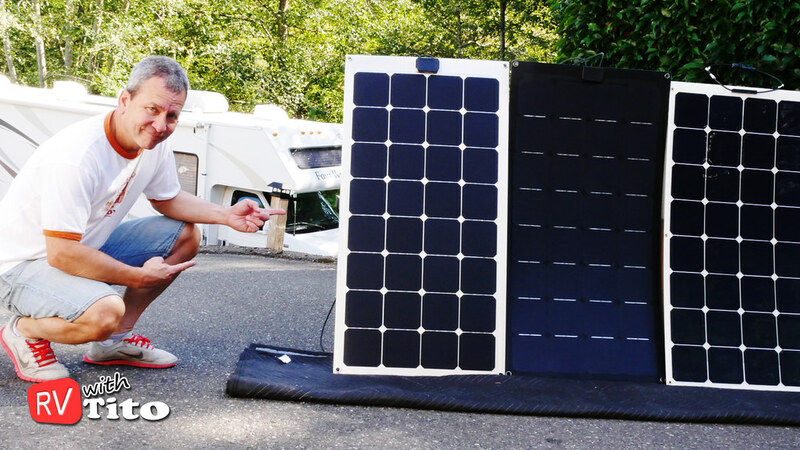 When I first started putting solar on my RV, I was really excited about the flexible solar panel option. Understanding that many say rigid panels are better, four years later I am still satisfied with my decision to go "Flexible" with solar. The choices were very limited back when I purchased my first Unisolar thin-film panels off of eBay. I have since expanded my solar array and upgraded my charge controller three times, but the original Unisolar panels still produce half of the solar power generated on my roof. The flexible solar panels available today are much more efficient than they were four years ago. This could be due to the cost of monocrystalline solar cells dropping. Or perhaps advances in the manufacturing process and encapsulation materials could have something to do with it. Regardless of how it happened, as consumers we now benefit by having more choices at a lower cost. Gone are large thin-film solar panels. 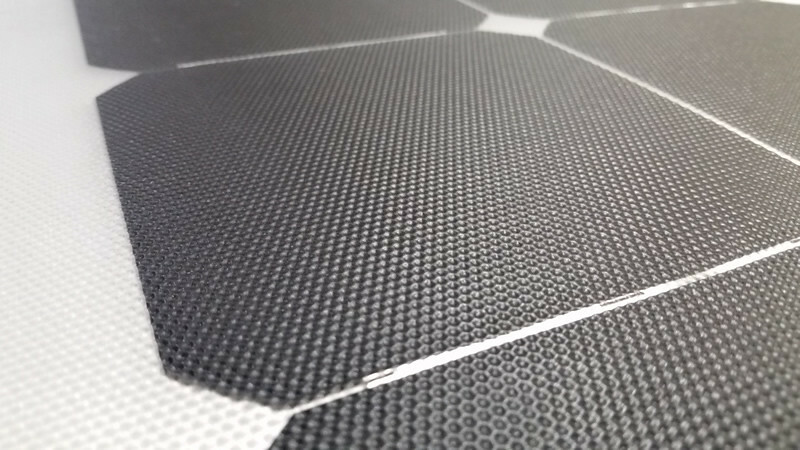 Lightweight thin high-efficiency panels are now the norm in today’s flexible solar panel market. They are also affordably priced just above their rigid counterparts. 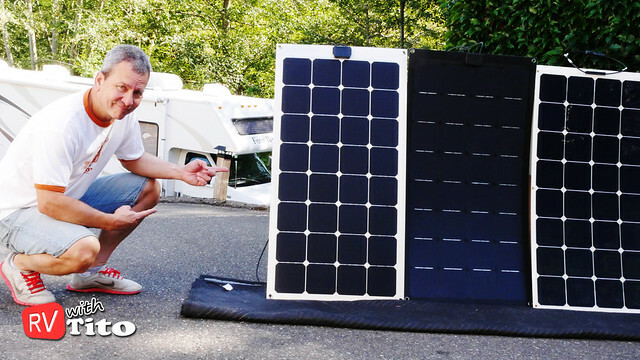 RVs, campers, boats and vans can certainly benefit from solar panels that offer light-weight, high-power, versatility and great asthetics. If you’ve purchased or have been shopping for flexible solar panels on sites like Amazon, you may have noticed that the flex panels that come up in the search results look strikingly similar. You might be asking “Which one should I buy?” I always start with customer reviews focusing primarily on those flagged as “Verified Purchase”. This helps weed out the fake reviews. Once you’ve narrowed it down to a few quality panels, you can start comparing features. Most flexible panels today use high efficiency monocrystalline solar cells. Some manufacturers even disclose the brand of solar cell (like Sunpower solar cells) used in their panels. Solar panels like those from HQST also use what are called “Back Contact” solar cells. These cells have the electrical connections on the back of the cell. They claim to be able to collect more sun. They also give the solar panel a much cleaner look. Each panel has its specifications printed on the back of the panel. The panel’s maximum output (watts, amps and volts) are all listed there on the back. Reputable manufacturers will test each panel under Standard Test Conditions (STC) prior to packaging to ensure it measures up to its specifications. Nevertheless, I recommend doing your own basic tests with a multimeter to verify proper operation prior to installing. The monocrystalline cells used in modern flexible panels are actually quite fragile. For that reason, modern flexible panels are really not that flexible. They can be bent slightly to fit curved surfaces, but should not be bent more than 20 degrees or so. If bent too far, you could damage the solar cells or connecting wires inside the panel. Most flexible solar panels on the market today have a clear laminate front layer and a solid white backing. Some manufacturers are using other materials, like ETFE (Ethylene Tetrafluoroethylene), to increase the longevity and durability of their flexible panels. ETFE is lightweight and strong material with a non-stick surface that resists dirt and heat. There are also panels available that have an aluminum backing to help dissipate the heat generated by the solar cells. The length of the cable and type of connectors provided can vary from one manufacturer to another. Many are DIY modules, so the come pre-wired with MC4 connectors. The length of cable can vary though. Some may come with roughly 10 inches of cable, while others may have up to 5 feet of cable. When planning your system, count on having to order extra connecting cables to connect your panels and solar charge controller. You can also make your own solar cables cut to exact lengths for a cleaner install. 100 watt panels are the most common size for flexible solar panels. Simply search Amazon for “100 watt flexible solar panel” and you’ll see prices ranging from $160 to $500. So what is the difference between a $500 panel and a $160 panel? You may be paying for higher quality materials and components or the reputation of the manufacturer. The bottom line is that it is really hard to tell the difference. If you are looking for assurances, many manufacturers offer a multi-year warranty. Be warned that there may be hidden terms that make it difficult to return or get a refund. So be sure to read the “fine print” and understand the limitations of the warranty. It should also be noted, that purchase through an Amazon Prime account may help simplify returns if products are received defective. Piecing together a decent solar charging system with DIY components purchased online can be challenging. You should always allow for a little trial and error. Figure out which components you can compromise on and which you should not. I pick highly rated panels at the lower price point and treat them as consumable items. That’s where I compromise. Doing so enables me to spend more on a more expensive key components like a high quality MPPT charge controller or power monitoring system. Prior to installing the panels I do some basic testing to ensure they are performing at the expected levels (as indicated on the back of the panel). After all, Amps are Amps. I believe an inexpensive panel performing up to its specifications is just as good as the expensive one that performs to spec. Once tested, I mount them securely making sure they can be removed if needed. That way, if panels wear out prematurely or fail, then it is a simple remove and replace fix. So far, I haven’t had to replace any panels. Got something to add? Share your own tip.